Detect and delete blank pages in scanned tiff and pdf files in batch. Everybody who ever dealt with scanned TIFF and PDF files encountered a problem of blank pages. 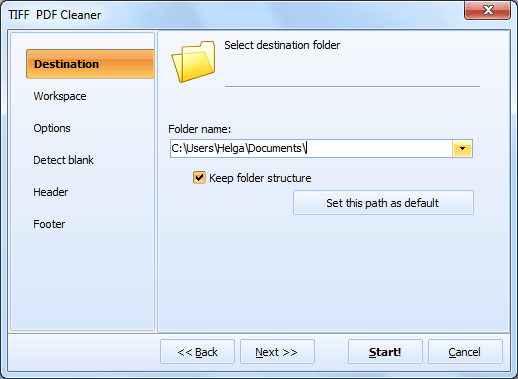 Tiff Pdf Cleaner detects blank pages in TIFF and PDF files automatically and deletes them. It goes through the designated folders and searches every TIFF or PDF file in them. You can set even several folders - Tiff Pdf Cleaner will process images recursively (process sub-directories), keeping the folder structure in the output location. If you want to double check if the page is blank indeed, the program can extract blank pages from your files and save them as TIFF or PDF files. 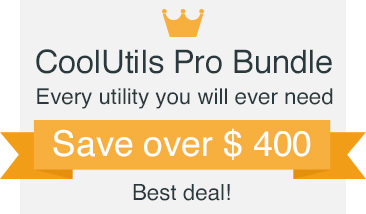 You may process them later manually to make sure no important data is lost. Tiff Pdf Cleaner can delete the unnecessary black border from you scanned files (black border on white background only). The program supports both color PDF/A, and bitonal TIFF documents. You can set the workspace to analyze. In other words you tell the program what exact workspace must be blank to delete the page as the blank one. That's most convenient as blank faxes still have footers or headers and other software will not detect them as blank. More options..
You may also get the summary of what Tiff Pdf Cleaner did in History Journal. After the process of deleting blank pages is over Tiff Pdf Cleaner will tell you what files it processed and how many pages it detected and deleted/extracted. Tiff PDF Cleaner has intuitive interface. You will figure out how it works in seconds. Advanced users can use command line. Get your copy now to delete all blank pages in one go! "Our company is very satisfied with the process and easy accessibility of our TiffPDFCleaner. Uploading mail, documents and so forth into here has been very self-explanatory for all users. We use this software primarily to delete blank pages from large documents and everything has come out accurate and smooth. Thank you!" "I had a single use case, which was filing all my mail correspondence and wanted to remove blank pages from PDFs. This is working like a charm. I am using with WatchDir which monitors my scan directory and when a file arrives it runs TiffPDFCleaner via BAT to remove the pages. Works like a charm." Tiff Pdf Cleaner reduces manual work dramatically; it detects blank pages in thousands of files in one go. 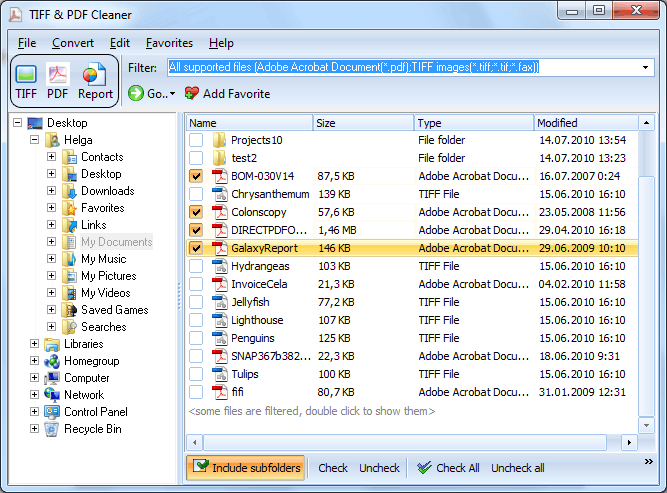 Tiff Pdf Cleaner will easily process many folders (with any number of subfolders) and keep your folder structure! The History Journal will tell you what files were processed and how many pages were detected and deleted/extracted. Tiff Pdf Cleaner can automatically add page numbers or stamp bates to each page. If your files were not scanned properly you will appreciate auto-deskew (straighten) option offered by Tiff Pdf Cleaner. Tiff Pdf Cleaner can also print out PDF and TIFF files for your convenience. Total PDF Printer features a clear straightforward interface with lots of hints for beginners. The app can extract blank pages and save them to a new folder for you to double-check that no important data is lost. Some pages can have borders or a logo but still have no data. To consider them blank, you can set the workspace to analyze. Sometimes scanned files have noise. There is a special Tolerance option that allows you to set if you want to delete those pages as blank. Tiff Pdf Cleaner can convert TIFF to PDF and vice versa while deleting blank pages. If your files have unnecessary borders, Tiff Pdf Cleaner can auto-crop them (works only if the page is white and the border is black). We also offer a server Tiff Pdf Cleaner (SDK). It has no GUI, no interrupting messages. Print PDF files via command line. No need to learn the params, just get the ready-to-use command line from GUI settings. How to add file name to the header of each PDF page?